Close your eyes for a second, and envision a world where a young beautiful bubbly female star—like Taylor Swift maybe—releases a completely traditional country album, not of her own music, but of some of the standards from country music’s sainted past, and not just by herself, but as duets with the very stars that made the songs popular in the first place; the same stars who are very much being forgotten in modern country’s obsession with youth. Think of the possibility of how this could open up an entire new world of music to listeners who are too young to remember where country music came from, ostensibly bridging the future and the past. Now, open your eyes back up, and you’re ready to enter the world of Mary Sarah. Musicians, just like the rest of us, tend to fall within a dozen or so archetypes, with minor variations on those themes when considering the specific artist. You have the scrappy up-and-comer looking to make their name, the established journeyman, the superstar, the underground anti-hero, and so forth and so on from there. Even the most unusual musicians tend to still follow the same weird path of their unusual predecessors. But I have never happened upon a performer that is so hard to pin down, so hard to wrap your head around and really deduce exactly what’s going on as Mary Sarah, and specifically her duets album called Bridges performed with an incredible list of country legends including Willie Nelson, Merle Haggard, Dolly Parton, Vice Gill, Freddy Powers, and Lynn Anderson. It’s not that Mary Sarah is “weird”. She’s far from it. In fact if anything, just how un-wierd Mary Sarah is makes this entire case study that much more confounding, and speaks to just how much of a unique individual she is. The 19-year-old singer, born in Oklahoma, raised around Houston, currently living in Nashville, has the looks and disposition of a bona fide American superstar. Nearly every picture you see of her, she’s smiling. And when she’s frowning, it’s to be cute. She’s happy, well-adjusted, confident, illuminated. She’s almost too perfect in some respects, like you want to take some dirt and rub it on her just to make her more real. It’s hard to tell if there’s anything dark lurking behind that perfect hair and haloed smile. If you want to be a step ahead of the game in the music business, it’s best to keep one eye on artists coming out of adolescent development, and that’s where we first spied the young Mary Sarah. Like so many young country stars these days, Mary Sarah came out of the vocal coach ranks, and the stage show environments like Kidz Bop that look to begin developing stars at a very young age. This isn’t the “picked up guitar in college to play at coffee shops for tips” model, this is the fast-track, preordained conveyor belt to stardom. It’s about this time in the story that many independent and traditional country fans start to get turned off by how the biography of this young artist is playing out, and where it probably will lead. Yes, the cute little girl groomed for stardom since childhood becomes country music’s next manufactured star; we’ve seen this act before and it doesn’t result in anything we’d be interested in listening to or seeing. And it’s at that moment when Mary Sarah completely surprises you. Along with participating in things like Kidz Bop, Mary Sarah was also touring around Texas as a young teen, playing churches and the little Opry houses around Texas that are nestled in the forgotten spaces of rural America where the sound of traditional country still thrives. It was a tale of two worlds for the young singer, and in 2010 she released an album called Crazy Good. It was like early Taylor Swift, with songs about boys and young adolescent struggles, but with steel guitar and banjo, illustrating the double world that lent to Mary Sarah’s influences. 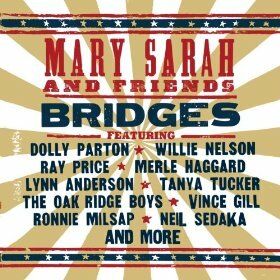 The first song off of Mary Sarah’s new album Bridges that hit our ears was a duet with the late great Ray Price on his old standard “Heartaches By The Number”. It was released very shortly after Ray Price had passed away, and it was one of the very last recordings Ray Price ever made. Here is Mary Sarah with her perfect skin and a glittering personality, rubbing elbows with a legend like Ray Price. What was going on here? And then you gave it a listen, and were blown away. First off, Ray sounded incredible, so strong and lucid and inspired in his performance. And Mary Sarah, her voice was not only big, powerful, and confident, it had that distinctness to it, just a little pinch of something that you’ve never heard before that is the mark of all singers that are not just technically good, but have a talent that is lasting. Then looking deeper into this Bridges album and seeing that the young singer had worked with Dolly Parton, Willie Nelson, Merle Haggard, Tanya Tucker, and the Oak Ridge Boys, even Freddy Powers, clearly something much deeper, much more complex was going on here than a fast track to pop stardom. Whatever was going on, it still had tremendous money and management pull behind it. It still had that “fast track to stardom” feel. Billboards have been erected in Nashville promoting this album. The recordings are of the highest quality, and include some of the best and legendary country music talent still living. And as for the concept, it’s hard to argue that it is anything but brilliant. But the cynic in me begins to wonder about the motivations. Why would a young girl like this with such a powerful, undeniable voice and right on the verge of stardom take this certainly cool, but highly unusual route? Maybe back in the history of country music, I’m talking the 70’s or even before, artists wanting to make a name for themselves and get started in the business would make an album like this. But in 2014? It seems like such a strange approach, though still sort of genius. And the results, especially when you narrow your focus down to some of the specific duets, can’t be argued with. The Ray Price duet already received SCM’s top grade. The duet with Dolly Parton on “Jolene” is something other-worldly, and may be one of the very top performances of this iconic song ever cut. Nobody is a harder duet partner than Willie Nelson because he insists on singing in unintuitive pentameters, but the production of Mary Sarah’s “Crazy” duet allowed both singers the space to breathe and do their thing, yet still conveyed the intimacy of a classic duet. And meanwhile, musicianship seems to be no obstacle on this album, as an army of A-listers make their way into the studio to lay down some of the slickest recordings of classic country music you can find. “Go Rest High On A Mountain” with Vice Gill starts off sparse, and then positively soars. Some of the song choices and duet partners coming from such a young girl are most curious, but also cool. Who would have thought for the Merle Haggard duet “The Fightin’ Side of Me” would be chosen over something like “Silver Wings”? But the decision shows guts and spirit. Freddy Powers may be the least-recognizable name on the track list, but his inclusion here and his role as a mentor to Mary Sarah gives her and this project a country music street cred it otherwise wouldn’t carry, while the Tanya Tucker and Lynn Anderson duets on “Texas (When I Die)” and “Rose Garden” respectively give this album it’s fun moments. As great as the great songs are on this album, the misses miss pretty bad. It’s not that the performances aren’t spot on, but the curse was cast in the song selection. “What A Difference You’ve Made in My Life” with Ronnie Milsap is incredibly shag carpet and saccharine, almost like a song that would play when the credits of an 80’s after school special are rolling. The “Dream On” effort with the Oak Ridge Boys comes across as dated, despite the flawless presentation. And “Where The Boys Are”? The composition actually fits Mary Sarah’s voice perfectly, but once again stuck out as a strange song choice. To 60-year-old ears though, these songs may sound quite fitting and nostalgic. Overall, this is an album of individual songs and performances, whose selections should be looked at individually because of the disparity of the material, and the different duet partners. Traditional and classic country fans will love most songs, some will hate others, but the count of good to not good definitely ends up in Mary Sarah’s favor. I still have absolutely no idea what’s going on here, and in some respects, I don’t want to know. And one thing this album doesn’t highlight is that Mary Sarah also has songwriting as one of her strong suits. Mary Sarah could develop into the Taylor Swift of traditional country, bringing huge crowds back towards country’s classic sound. Or she could develop into the next Taylor Swift, period, and maturate into a pure pop performer. Or it could be something in between, or completely unique that country music has never seen before and can’t compare to anything else. Is this album simply a way for Mary Sarah to pay her penance to the traditional country music powers that be so that she can run off and play pop? Or does it speak to a sincere desire to create a career behind “bridging” the old and the young, the classic and the contemporary? Time will tell, but I ‘m telling you, with a voice like this, and a spirit behind it that is so unique, it’s probably imperative on all of us to be paying close attention. 1 1/2 of 2 guns up. I like what I’m hearing….really like what I’m hearing. But I will reserve judgement after we get her next album. This is more like an introduction to the wider country music fanbase….and it’s a good one, yeah….but show me what she can do with new songs. Take a listen to her Album Crazy Good, original music on there. While, in the 2 songs embedded here, it is clear that her voice is still young needs to mature a bit, liking what I hear. And the fact that she chooses some of these songs shows that this isn’t a manufactured “duets” record. Seriously, who but real country fans would know who Ronnie Milsap is these days? I listened to 90 seconds of each song, and the Milsap cut impressed me the most (and Jolene). As for her voice needing maturity, I found it a little “thin” for my taste. Especially on the duets with females. Maybe that’s the same thing? I like enough to buy cuts, but not sure about the whole album yet. And I never not buy whole albums in order to support the artist. I get the impression though that she doesn’t need my support. This reminds me in spirit of LeAnn Rimes’ wonderful Unchained Melody: The Early Years album. A young artist with a great voice doing old material sounded oddly fresh then, and I think it does even more now. I’m intrigued, and will definitely be checking this out. Will be interesting to see where she goes from here. I’d sure love to see a young, talented female breakout star who knows her roots. If a major label signs her, her traditional-sounding songs will go bye-bye. I don’t like to comment on artists I have not given a full review in comments because quick, abbreviated comments can be taken the wrong way, blown out of proportion, etc., and that has happened to me many times over the years. I receive a curious amount of requests to speak on Cody. I will try to post something soon. I don’t think it matters how she got to where she is; It sounds like she knew what she wanted to do, had talent, and got some schooling. Same as a young kid getting football coaching. re becoming a pop singer, I think it’s hard to criticize someone in the music business if they have an opportunity to make some money, and it involves some commercial compromises. It’s pretty hard to make even a basic living as a musician, songwriter, or singer. Most full time musicians live in poverty. Both tunes sound very good to me”¦. and great pickin’ specially on the Ray Price tune. You kind of gloss over the only track without a duet partner, “I’m Sorry,” as well as (of course I’m going to mention this) the one with Big & Rich, “My Great Escape.” What did you think of these? And for once, B&R would be relevant to an article on SCM and you ignore their input! 😛 If anything, their inclusion here is just another example that they deserve another look. Alongside the rest of these legends they seem decidedly out of place. It surely must be respect for the genre that so many people claim they lack. I didn’t mention the Big & Rich song because I didn’t really have anything to say about it. It didn’t really strike me as one of the good or bad tracks on the album. I didn’t mention “I’m Sorry” because the early review copy I received of this album doesn’t have it on there, so I’ve not heard it. Ah, gotcha. I figured as much with the B&R collaboration; either that or I thought you were neglecting to mention it because you thought it might drive would-be fans to avoid the release. I’d have to agree, though. It’s not one of the better songs on the album or by either of the parties involved, but it’s certainly still good. I can imagine that to one as steeped in country music and its history as you are that a collaboration with a modern crossover act with a dubious-at-best reputation is comparatively small potatoes (if anything at all) when compared with the likes of the legends on display, particularly Ray Price. I still think you might have at least mentioned the song, though, even if you didn’t feel much for it. At first it had me questioning whether it had ultimately been left off of the album entirely or if I was confusing this album with another. Just for the sake of forming a whole picture, particularly since it was the only track you didn’t mention in any form or fashion among the whole set you received. This scenario has become less and less surprising of late . GREAT voices are moved by and want to sing GREAT melodies and great , timeless songs . That’s a given . They want to be challenged and they want to be able to move people the way THEY were moved . AND they want to write great songs. Modern country radio offers almost none of the inspiration needed for a seriously talented young artist to become so impassioned by melody and lyric that they want to carry the torch of the great traditions. Lee Ann Rimes , Martina McBride , Ashley Monroe , Brandy Clark , Sturgill Simpson , Josh Turner and others have all taken a turn at this to greater or lesser degrees of success . Mary Sarah is now another . I have several female music students- just 16- who write and perform regularly . I’m reminded of the power of great songs each time we get together . They bring songs to work on that I’d never have believed could still be so emotionally evocative to musicians their age . I am a believer when I hear them and artists like Mary Sarah sing those songs with voices and talents that would , seemingly , demand no less than that GREAT material to work with . From Dolly Parton, Tanya Tucker classics to any number of traditional folk …even Celtic -influenced material ,the common denominator is story, substance, and melody .Listeners have been allowed to forget the power and emotion in these three things . I’m encouraged that so many younger artists are listening ‘outside the box’ and finding what needs to be’ inside the box’ once again . Good feature from the Associated Press about Mary Sarah just got posted. Well, those two tracks were pretty darned good! I guess I’ll be one of the “I’ll reserve judgement until I hear a future album” people, but if it’s as good as these tracks (even without the guests), I’ll be more than willing to overlook the Kidz Bop connection. Go Rest High on that Mountain is one of the better renditions I have heard of that track. That song has so much weight to it and she did a really good job of just singing and not trying to do too much extra to take away from it. Why did Florida Georgia line get 2 guns up, and this girl only 1 1/2 guns up? I don’t review names, I review music. Also you’re comparing an album with a song: apples and bowling balls. I would have also given “two guns up” grades to her duets with Dolly Parton and Vince Gill. There were also songs on this album as I said in the review I felt were weak and dated. Also any album that is covers exclusively is already going to start with a slightly diminished grade. I’m not gonna get excited about this. Whaaaa?? Lee Ann Rimes has had an AMAZING career ..mostly WITHOUT the help of country radio , thank you very much . Her BLUE album put her on the map because of her undeniable vocal talent and her ability ,at only 13 ,to inject emotion into everything she sang . He most recent album “SPITFIRE” is a vocal performance and production clinic as she delivers on a stunning range of material from gut-wrenching ballads to all -out- in-your-face rock featuring Jeff Beck . The ‘Big Little Towns’ , the ‘Lady A’s’…any flavor-of-the-week female vocalist you might name could learn a ton listening to Lee Ann Rimes weave a song into your soul with a trademark style and capacity to deliver that is second to none . EVERY song EVERY time she’s up to bat in the studio or live , Lee Ann pours her guts into it . She constantly pushes the envelope with her material while honing her writing skills . Lee Ann has been , sadly , ignored by modern country , as have so many greats , but the incredible thing is that she has just turned 30 and has a track record most don’t have after even 50 years in the business . In case I haven’t made my point , I think the woman is an overlooked and under-appreciated vocal treasure… a Capital ” A ” artist . .
We should also not forget Curb’s role in marginalizing her. Was not aware of this, Eric …Boy does that answer a few questions . I knew McGraw had gone through similar challenges . Didn’t really miss him , though ( trend-chaser ). She has a great voice and they’re great songs, but the covers are so straightforward you might as well just listen to the originals. She has plenty of potential, but I won’t get excited until I hear some original tunes from her. Her voice is thin, and it needs to mature or develop. And……if she wasn’t young and cute no would give her much buzz. This is showbiz, and looks matter, especially for women. I think it is refreshing that a pretty face takes up the cause for traditional country music instead of going the stereotypical pop route. And personally, I have no idea where these “thin” comments are coming from about her voice. I think it is incredibly full. To me, it’s a howitzer. There are many open questions I have about Mary Sarah myself, but her voice would not be one. This is a matter of taste of course, but I don’t think that “thin” is the correct term. I think the background vocals overpower her voice a bit in (Texas) When I Die which is why some people have made comments about her “thin” voice. I disagree. Heartaches by The Number proves she has a powerful voice. I had the chance to see her perform a year ago or so and I was impressed by what I saw. she is genuine and was really charismatic on stage. Especially for an 18-year-old girl in front of a good thousand people.